The new Addington Knitters meet every Friday in Miss Blackburn's classroom where they are learning all sorts of knitting, including finger knitting, French knitting and crocheting. Miss Blackburn got her husband to put nails into wooden blocks so that the children could learn French Knitting. She says the children have been working extremely hard and all of them seem to enjoy the knitting. 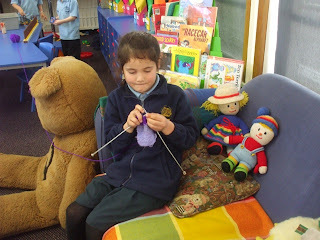 Many of the children take their knitting home and have inspired other family members to take up knitting. 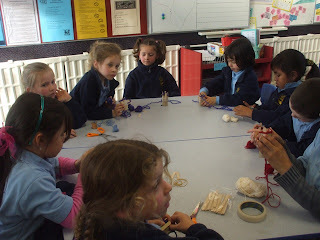 At playtime and lunch times you can see children knitting around the school.